Summer is here! Sadly.. summer classes makes it worse. Recently saw this and knew I just had to vector it. Figure with the summer here I'd try and learn Illustrator again but as it would seem I don't have the talent for it xD attempt failure #2 so back to PS. I tried to keep it in it's original state so you'll probably notice a few extra lines and colors in and out of lines (color intended, although probably not what most people are looking for.. oh well). Not to much to say so enjoy. I love this one of bleach its so cute and I never get to see them this happy hahah they are always on each others nerves. nice one! actually I wouldnt be able to vector like that because I always think it would be messy... but you did a nice job! keep it up! This is too cute! I love the colors and the way you vectored it! Really well done, this totally made my day. Lol, so comic-like nicely done. OMG! I just happen to LOVE Ichigo! Ah sweet! Although the lines are abit jagged, and intended colour leakage isn't that good, but anyway, I love the simplicity. Though your choice of colours can be better. Ooh, this is really cute! Ichigo and Rukia looks so cute here. <3 Great work, love the vectoring! I liked how you didn't stick to the outlines, and the baby-blue in the back is the perfect final-touch. i love it..i rarely see ichigo smile which makes me really happy to see him smile in some pics..lol..thanks for sharing! 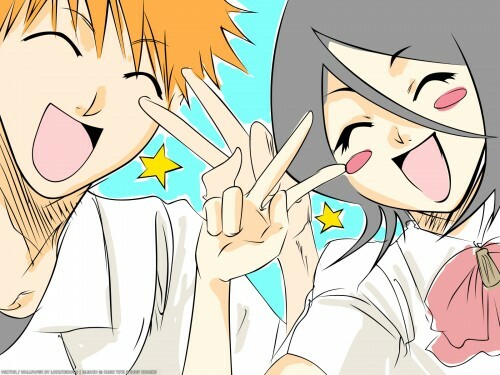 I have never seen Ichigo smile. Good job. It looks like he has smiled even after the death of is mother.